At Process Street, we’re always asked about the best ways to construct, track, and analyze processes. 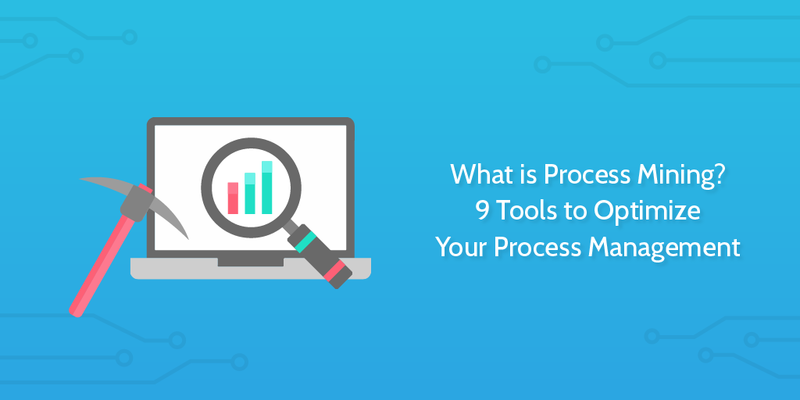 There are loads of techniques in the school of business process management to help you with these three concerns but in this article, we’re going to give you an introduction to process mining; a data driven way to create, understand, and optimize your processes. We cover solutions for enterprises all the way down to basic approaches for startups. Jump in! In short: Using software to look at what the people in your company do, and having the software describe those actions to you in the form of processes. Slightly more technical: Process mining is a family of approaches which look at data from event logs to see what people are doing. From looking at the steps someone takes to complete a task, a process can be automatically constructed. By continuing to gather this data over time you can start to see where bottlenecks occur or where inefficiencies lie within the process. Automated Business Process Discovery is the technical term for what people commonly refer to as process mining. However, with process mining as a concept having been used for a range of different use cases, Automated Business Process Discovery has kind of taken on a role as a sub section of process mining. In short, ABPD is about tracking event logs to discover what people are doing and then defining a process around those actions. For example, a lot of the software I’m going to mention integrates with Salesforce. Salesforce records everything the users do in the app. ABPD would look at all that and then write it down for you automatically in the form of a process. I’ve pretty much taken the general purpose definition of process mining and tacked a further clause onto the end of it. This is because finding out what people are doing isn’t an end goal. The end goal is what that knowledge can help you do or what impact that knowledge can have. In the case of ABPD, the knowledge of what a person is doing is then used to construct or document a process. This might be used by a company which wants to formulate its standard operating procedures. Writing standard operating procedures in a large company which doesn’t yet have them defined is a time intensive task which needs input from a huge number of stakeholders. This is where process mining approaches like ABPD come into play. By utilizing software able to track event logs, the company can automatically generate processes and process maps of pretty much the whole organization. For certain roles it might need buy in from the team and some members may need to record their activities more than normal, but in general the process discovery is non-disruptive and can be done relatively quickly without too much labor commitments. This is the classic element of process mining, and is super useful for existing teams who want to transition over to ISO standards or business process management. Once you have your processes defined, the next step is to make sure people are following them and to check the process is working. This is often referred to as conformance checking. Strictly, conformance checking is analyzing the event logs to check actions line up with the process model. For example, you write down that an employee needs to take steps 1, 2, 3, 4, 5, and 6. But the data from what people are really doing shows that people aren’t doing step 4. Now you know, and you can act on it. In that sense, where the previously mentioned ABPD helps you find processes, conformance checking helps you make sure people are following already determined processes. 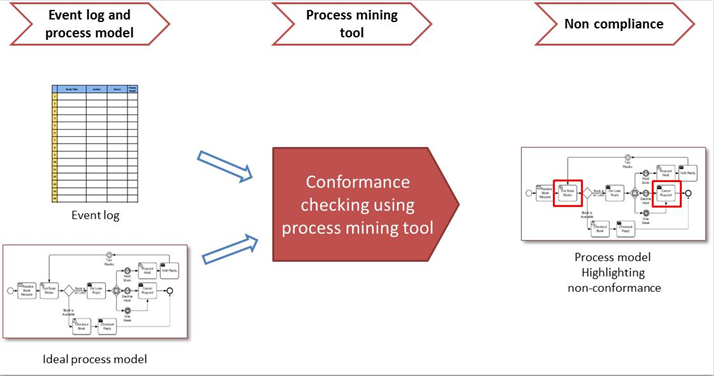 Utilizing process mining for conformance checking is more suited to companies who already have procedures or processes in place. It’s because of the differing needs of businesses that these two concepts become combined under the same label of process mining. Ultimately, both approaches mine event logs to discover how processes are being used in real life, then either apply that knowledge by documenting it or apply the knowledge by comparing it to what was previously intended. This is the third application of process mining, and the one which pulls the previous two together; how well is a process constructed and how well are people using that process. One of the purposes of having effective processes in place is to improve your operations. So, how do we go about doing that? From event logs we can see information like how long it has taken a person to do a specific task. Perhaps we believe that task can be done much more quickly? Identifying the potential inefficiency within the log can lead you to go-see (genchi genbutsu) the potential inefficiency in real life to investigate and see whether it can be improved. That’s a simple example, but the complexity of analysis you can go into depends largely on how much time and effort you want to put into analysis and the depth of data you can gather. You could implement Six Sigma techniques and principles across your organization, depending on the use cases. For a more general purpose investigative method to boost your process improvement efforts, I recommend checking out the Deming Cycle. The Deming Cycle is commonly known as PDSA – sometimes known as PDCA, but Deming himself referred to that approach as “an aberration”. Deming advocated sticking as closely as possible to the scientific method in your business performance investigations. With the data from event logs, you could implement his approaches when looking to boost the performance of your teams! I’m going to use this section to point you in the direction of certain tools which you might find useful at applying different elements of process mining to your business. The first 6 are paid tools – though may have free trials or freemium structures – and the final 3 are open sourced tools for those of you who want to process mine, but don’t quite have the budget right now. Process Street doesn’t do the ABPD aspect of process mining, but it can be employed to achieve the other two process mining goals highlighted in the overview above. With Process Street you create templates of your processes and have users run them as checklists. This way, you can set employees to run a checklist every time they approach a task. You will then see whether they worked through the process as intended or not. The big advantage of Process Street is that it massively increases process adherence. It forces people to follow a process, and a well constructed template with form fields, conditional logic, and file uploads makes following the process an essential part of completing the task. In this sense Process Street excels at conformance checking and goes a step further; it enforces conformance. Within each process template you’ll find a template overview. This screen shows you every checklist which has been run from that template. It also shows you all the data entered into the template and relevant metadata. You can export this data as a CSV file and run your own analysis on it. This kind of actionable data can be used to power your optimization efforts. You can sign up for Process Street for free and check out the pricing page for more features and users. QPR has a range of tools based around process mining which can streamline business operations. The QPR Process Analyzer is one such product, which comes with a fairly comprehensive set of features. QPR is trusted by Nokia and Ocidental, along with other large companies. If you’re looking for an enterprise tool which gives you all the tools to run process analysis from mined event logs, then this could be a good product for you. Highly rated and very comprehensive. The QPR Process Analyzer appears to be priced at around $1000 per month per user. Kofax is a big player in the areas of robotic process automation and financial process automation. Kofax claims to be used by the majority of major banks, insurance firms, and logistics companies. Kofax Insight is one of the key analysis tools provided by the company to understand how your processes are operating, all from a single platform. All your event log data is pulled from a range of sources and then presented via the platform for easy analysis. It’s this platform which Kofax seem to be most proud of, boasting that everyone can see their performance data as performance management teams being able to dig deep into what’s occurring in different areas of the business. You can create customized reports and manipulate this dashboard to suit the needs of the team. All this can be done without using code – which makes it a flexible tool to use across a business where analytics are decentralized and more lean. A powerful enterprise tool, it’s probably best to enquire about pricing. ARIS by SoftwareAG focus on business process management and has a range of products for different institutions and organization types. The ARIS Process Mining package boasts of a 360 degree view of how processes work in your business. Like the other tools mentioned, this platform pulls in data from a range of sources and then looks at how processes function in real life. It then allows you to set up how the process should look so that you can see where conformance has occurred and where variants are appearing. This can really help you crack down on problems and boost your process standardization. You can check out the ARIS community in order to learn about putting the product to use, and to engage with other users to learn how you can improve your use of the software. If your organization is in the education sector, particularly in higher education, then it is worth checking out how ARIS Process Mining can help you teach business process management techniques and how it could be put to use practically by academics or students: ARIS Education Package. You can gain a free copy here of ARIS Express, and you can contact Software AG for further pricing information on the more advanced versions of the product. Celonis claims to be the world leader in process mining. A recent unicorn company after just 6 years, Celonis’ products have a clean and modern design. Celonis focuses its sell on leveraging machine learning to calculate ways you can make your processes more efficient. Instead of just working out what is happening and whether there is conformance, Celonis’ Proactive Insights (PI) tries to calculate these decisions for you. It brings in data from Salesforce, Oracle, Microsoft Dynamics and many more platforms. This data is then visualized in an easy to understand way, and presented along with the recommendations for improvement. Another enterprise product with clients like Exxon-Mobile, Lockheed-Martin, and Uber, Celonis is definitely the up and comer in this space! One to watch out for! You can organize a trial of the product before purchasing, but to find out what pricing solutions Celonis can offer you will have to contact their sales team. Icaro Tech‘s EverFlow product provides a competitor to many of the tools listed above. As you would expect, EverFlow tracks event logs to discover processes and then has tools set up to help you identify the failings and flaws in those processes. In this sense, EverFlow has a lot of similarities to the other listed options but it also has some interesting features of its own too. Its 3D process maps are really interesting and I think quite helpful for understanding complexity. Often, we’re shown process maps in promotional materials which are simple and straightforward – but life isn’t like that. Real process maps can be complex and messy with so many stakeholders and information flows. The 3D visualization of this is a really good move. Moreover, EverFlow boasts of being able to discover sub processes and customer journeys as part of its ABPD, and provides direct export functionality to send these discovered processes directly into third party BPM suites. Plus, Icaro has multi-language support in English, Portuguese, and Spanish. Contact Icaro Tech to find out pricing. As well as the paid options listed above, we’ve pulled out some free open source alternatives for you to take a look at. Having the power of a massive corporate machine behind you is great but, let’s be honest, we don’t all have the cash for that. These tools can help you try process mining without breaking the bank. ProM Tools offers a range of process mining applications on an open source license. These tools run on Java so can be easily integrated with other platforms. The community maintain the tools and develop plug-ins to help you make use of the ProM selection. If you’re tech minded and have a good idea what you’re doing, the ProM Tools selection could be a really good option for you! Definitely check them out and give back to the community in the process. Apromore stands for Advanced PROcess MOdel REpository is designed as a business process analytics platform. While open source, you can give Apromore your money if you want to. If you’re utilizing Apromore in your business but find that you would benefit from a new plug in which the platform doesn’t yet have, you can simply contact the team at [email protected] to discuss sponsoring the development of that product. A powerful piece of kit with good documentation. Definitely one to check out! With Disco from Fluxicon you can download the software or buy it – your choice. Developed by academics, Disco is a comprehensive tool which has a broad array of features and a smoother user experience/user interface than the other open source tools, from my perspective. It seems a little more intuitive and resembles slightly some of the paid enterprise platforms in that regard. Disco advertises itself using a very catchy phrase: an x-ray for your processes. Which I like. I feel that sums up very nicely what process mining does and what its benefits are. It also feels like a more honest description than the constant references to machine learning and AI which cover the websites of the paid tools. If they could find a way to use the word “blockchain” then I’m sure the enterprise ones would. Quick and relatively easy to use for someone with previous experience of analysis software, Disco is certainly worth a look! Here at Process Street, we know that data alone won’t improve your processes. This data has to be used well through careful management to make your processes better. The people are the heart of your team, the data just helps you understand them. Involving your team in the creation and iteration of processes will give employees a sense of ownership resulting in them following the processes better. Optimizing processes in ways which let your employees focus on creating value is best for them and its best for your business objectives. As such, here are 4 key tips we’ll leave you with so that you can act on the data you’ve gathered in the most effective ways. Make your processes actionable for workers. If you’ve leveraged process mining to try to discover your processes, now is the time to make them usable. Use process management software (like, I don’t know, Process Street?) to make sure your employees always have their processes available to them so they can follow them. If you make the processes interactive and put steps in place to encourage the workers to engage with the process, they’re more likely to follow them effectively. For example, they could enter data into the process checklist, which creates a record for you and also enforces utilization of the documented process. Improve process adherence through team buy-in. If you’re seeing poor conformance then it’s likely that your team don’t see the importance of utilizing the defined process. This could be a warning sign for a whole range of different causes. It could be that the people who do that job every day know that your process isn’t very good, so they don’t bother with it. Or it could be that a culture of shortcuts has seeped so deep that people are cutting corners as standard; normalization of deviance. The point is that it could be an opportunity to improve and that the mistake might be as much yours as it is anyone else’s. Try to involve staff in the process creation as this will increase their willingness to follow the process in future. Optimize your processes iteratively. Now that you have data to act on, you don’t have to make wholesale process changes to see and be able to judge output and results. With this new level of insight you can tweak and test; gradually improving your processes. This idea of continuous improvement is best practice within lean manufacturing principles from gold standard companies like Toyota. The Japanese concept of Kaizen is used within Toyota and is about continual iterative improvements. With all your data, you can make the most of these opportunities! Automate areas of your process to increase efficiency. In a recent webinar, our CEO Vinay Patankar revealed that the average sales team rep only spends 32% of their time selling, the rest is taken up by data entry and other supporting tasks. Once we have strong defined processes in place we can start to identify these bottlenecks and slow areas and look to see to what extent they can be automated. You can read our ebook on this here: The Ultimate Guide to Business Process Automation. If you’re a techie or stuck for cash, you could consider employing some of the free open source software. These tools can do serious data analysis and perform pretty much all the tasks you need them to do in that department. However, if you’re looking to run a truly lean organization and put process analysis and performance into the hands of each team, it seems a little like overkill to have to provide a specialist for all the teams. In these scenarios, maybe it’s worth shelling out for the big enterprise product, if only for the ease of use. Celonis looks to be the tool with the most intelligence built in – but for high priced services like these enterprise-targeted platforms it’s always worth your time to shop around and check out the different options on the market. As small to medium sized businesses go, my recommendation is this: Combine ARIS Express with Process Street. By teaming these two products up you can gain actionable data and then implement improvements effectively in your team through Process Street’s process management power. Have you used process mining in your business? What was your experience like? Do you have any tools to recommend? Let me know in the comments below!